The American Brain Tumor Association (ABTA) reports that in pediatric malignancies, brain tumors are the most common and are the primary cause of child cancer fatalities. It is estimated that 80,000 adults are diagnosed with brain tumors annually, with more than a third being malignant leading to 17,000 deaths per year. This cell line was established in the late 1980s from a female 67YO patient diagnosed with glioblastoma. SF-295 is identified to be homozygous for PTEN and TP53 and have a late stage phenotype. In vitro cell models (i.e. cancer cell lines) have been essential model systems for exploring the fundamental properties of tumors in preclinical research. Johanns et al. (2016) published a Brain Tumor Pathology study establishing SF-295 as a model for studying telomerase biology in glioblastoma; this is significant as malignant glioma often presents highly recurrent TERT promoter gene mutations. A 1994 study (Plowman et al.) 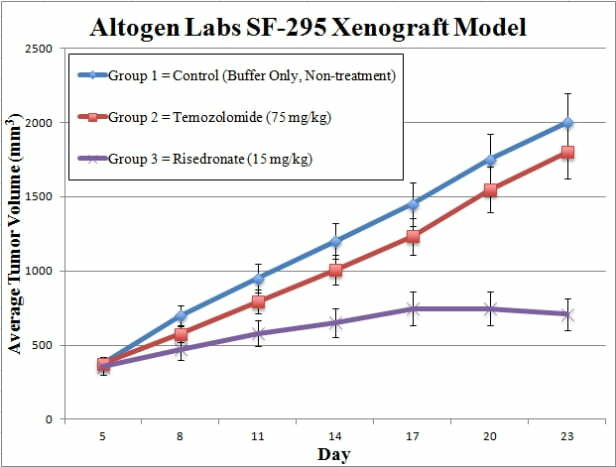 used SF-295 to demonstrate synergism between temozolomide, a methylating agent, and 1,3-bis(2-chloroethyl)-1-nitrosourea (BCNU, Carumstine), an alkylating agent, that resulted in equivalent efficacy and lower toxicity compared to individual treatment in brain tumors. In modern research SF-295 is a standard brain tumor model used in a variety of cell line panel projects, including the MD Anderson Cell Lines Project and the NCI-60 cancer cell line panel. SF-295 cells are continually grown at conditions of exponential growth. Cells are prepared via trypsinization, with viable cell counts determined using trypan blue exclusion. Cell suspension concentrations are diluted to the working concentration. One million SF-295 cells (1 x 10^6 cells) / per 100 uL injection volume in 50% Matrigel solution is inoculated subcutaneously into 10 to 12 weeks old athymic BALB/C (or NOD/SCID) mice. Each animal receives a single subcutaneous (s.c.) injection in the hind leg flank. Upon tumor establishment, animals are grouped into cohorts. Injection of the client provided test material is performed according to treatment schedule. Whole body mouse weights are recorded up to 3 times a week. Tumor measurements are taken daily. Tumor size limits determine the end of the study. Tumors are excised from the mice, weighed and documented (digital imaging). Collected tissues (for downstream analysis) are snap frozen in LiqN2, immersed in RNAlater or RNA/DNA isolated. Animal handling and maintenance at the Altogen Labs facility are IACUC-regulated and GLP-compliant. Following acclimation to the vivarium environment, mice are sorted according to body mass. The animals are examined daily for tumor appearance and clinical signs. We provide detailed experimental procedures, health reports and data (all-inclusive report is provided to the client that includes methods, results, discussion and raw data along with statistical analysis). Additional services available include collection of tissue, pathology analysis, isolation of total protein or RNA and analysis of gene expression. Our animal facilities have the flexibility to use specialized food or water systems for inducible gene expression systems. Altogen Labs provides an array of laboratory services using over 30 standard Cell Line Derived Xenograft (CDX) models and over 30 PDX models. Researchers investigating the role of specific proteins or gene products in regulating tumor growth can benefit from development of protein overexpression (genetically engineered to ectopically express proteins, tumor suppressors, or oncogenes) and RNAi cell lines with long term gene silencing. Altogen Labs provides quantitative gene expression analysis of mRNA expression (RT-PCR) and protein expression analysis using the WES system (ProteinSimple).